This is the foundational work of Authentic Golf. Everything we are about flows out of the concepts found within these pages. If ever there was a golf instruction book that blew the status quo of golf teaching right off its hinges, this is it. 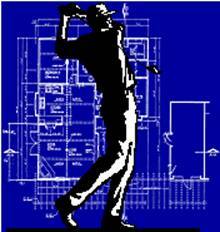 Different in concept, scope and implementation, The Blueprint gives you a golf swing construction project with teeth, and your very own “site foreman” to make sure you are sticking to the specifications. The “twilight zone” of golf Instruction. I don’t have video capability - I don’t want to hassle with video - I don’t want the video checkpoint service...etc. Can I still buy the book? No problem! The book only option allows you to purchase the book for $35, without the video checkpoints. If you decide later you need a checkpoint, you can purchase one for $10 (reg price $25). Actually, the best time to make improvements to your golf swing is when you are taking time off from playing. But really, ANY time is a good time to get started. It is a challenge to work on your swing during the middle of your playing season, as you have a tendency to try and incorporate the things you are working on into your play. The results often aren’t good because the improvements haven’t “taken” yet. It is better to take some time off from playing to focus exclusively on developing sound habits that can then be taken to the course once complete. For those that live in areas with a fixed golf season, my system is perfect for the winter layoff. Heck, you can even do the first two exercises in your living room during commercials while watching the game, or um…desperate housewives, or whatever! I’m not a “computer type person”, and prefer to have something printed – a hard copy. Is that available? Absolutely! Remember the book is delivered electronically as a standard PDF file, so you can print it easily on any printer right from your PC. If that isn’t an option, contact me and I will give you a quote to print and ship you a spiral bound printed copy. Since I do not have a volume printing contract yet, and with all the color photos, the cost of printing individual copies will be high. Your purchase price will be the cost of the book, plus the cost of printing and shipping. I will add $8 to these costs (I will send you the receipts from the printing contractor) and that will be your price. You say there is no need for a golf range or course – How does the learning take place without hitting balls? Very well actually! 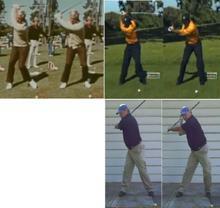 The way we learn a motion doesn’t change because it is a golf swing. The motions required to hit a golf ball long and straight simply must be practiced enough times so that they are ingrained. Your body and mind doesn’t care whether there is a ball or not. Most golfers are too “ball oriented”. When balls are hit during the swing acquisition process, the “result” is often not what we like. The player then becomes distracted by all manner of “unsuccessful” golf shots. Other disciplines like the martial arts, dancing, or playing guitar understand the importance of learning proper TECHNIQUE first, before “going live”. Removing the ball from the first critical stages of learning means the student is totally focused on the correct positions and motion. A side benefit of this is that the bulk of the learning can take place right in your own home or backyard. This eliminates the time and expense of going to the range! What makes your book/learning system different? We are designed by our Creator to learn all motor activity in a certain optimized way. The mechanisms and structure for learning new skills and habits is the same no matter whether we are learning to walk, tie our shoes, rappel down a cliff, snow board or swing a golf club. This is the system I use. The system I teach allows ingraining the correct positions and moves so that eventually you can do them without having to think about them. At the same time you are learning how to engage the subconscious to execute the habits that you have stored at the subconscious level. I know of no other golf swing instruction that brings the physical and mental parts of learning the swing together the way I do. By providing video checkpoints throughout the learning phase, mistakes are eliminated before they become ingrained. I know of no other system where this checkpoint service is provided at such a reasonable price. How does the video checkpoint service (VPS) work? What’s the process? How can you guarantee your instruction? I’ve never heard of a golf instructor that does that. I guarantee my instruction because I know my students will get better. The only way they will not get better is if they do not follow my instruction. Despite what many “pros” would have you believe, improvement in golf is easy to measure. You either hit the ball better or you don’t, chip closer to the hole or not, sink more putts than before, or not. But improvement doesn’t come without work. If someone doesn’t apply what I teach, they won’t improve. Thanks to video and the unique characteristics of The Blueprint system, it is also easy to determine who has applied the teaching correctly and who hasn’t. How does the guarantee work? What are the terms of the guarantee? The guarantee is available to anyone that purchases the full subscription option, and is valid for 18 months from the date of purchase. I want to make sure that you give yourself and my instruction an honest chance. One of the biggest obstacles people face when embarking on a golf improvement program is what I call the “tip of the day syndrome”. We try a tip, or take some lessons, or try a new swing method in the hopes of improving. When it doesn’t happen in the time frame we expect, we declare “it doesn’t work” and move on to the next thing. Wash, rinse and repeat over and over! I will not allow that to happen with my students. I KNOW my instruction works…if it is followed. I also know when someone isn’t “working my instruction”. To see positive changes that will last a lifetime will take time and effort. But if after 18 months of following The Blueprint, having utilized all your check points and completed The Blueprint, and you still haven’t improved, I will refund your money. How long will it take to have “a swing I will never forget”? That’s what we all want to know isn’t it? In our “instant gratification” society we all want to have whatever it is we want immediately and this includes golf improvement. But the fact is lasting changes take time. Some take more time, some take less time. It takes as long as it takes. The better question to ask is “If it takes you1-3 years to build a swing and game that will allow you to shoot 70’s golf the rest of your life, would it be worth it?” However, you will see some improvement along the way as you progress through the program. What are your credentials? Are you a PGA pro? Why haven’t I heard of you? This is a commonly asked question and it deserves an honest response. For someone that needs a teacher that “has credentials” I have no good answer that will satisfy them. Go find yourself a PGA teaching pro, buy a book on the swing written by a famous player, or sign up for one of the $1,000 golf schools. My credentials are simply this – that which you will learn. It is the same program this 100’s shooter used to develop a swing and game to a 70’s shooter. My offer is simple and comes with a guarantee. Remember, If you complete my program as instructed, and do not improve I WILL REFUND THE ENTIRE COST – NO QUESTIONS ASKED.